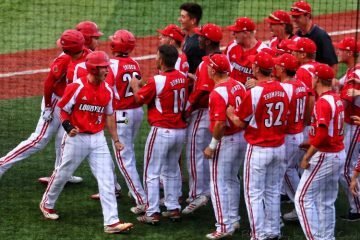 Unable to capitalize on a 5 game winning streak which included a dominating performance over arch-rival Kentucky, a pair of collapses downed the #20 Louisville Cardinals (26-13, 10-11), resulting in their 5th ACC series loss, this time over the Virginia Cavaliers (24-17, 9-12). The Cardinal Nine were not only on the verge of a series win, but potentially a sweep. On a positive note, designated hitter Danny Oriente his stride over the weekend, batting 6-8 with 4 RBI and Bobby Miller came within 2 outs of a complete game shutout. For the game 1 series opener against the Cavaliers, the Cardinals’ offense ran through designated hitter Danny Oriente as the sophomore drove in 4 of Louisville’s 5 runs including the go ahead run in the eighth inning. He registered a pair of hits and a sacrifice fly, and his 4 runs were a career-high. Also on the day, sophomore first baseman Logan Wyatt went 3-4 and sophomore shortstop Tyler Fitzgerald drove in his third home run of the season. 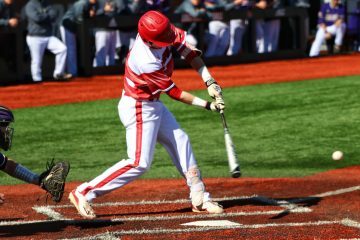 It took a few innings for the Louisville offense to get rolling, with the contest being deadlocked in a pitcher’s duel for the first few innings, but they would be the first team to crack the scoreboard in the fourth inning. An RBI single from Danny Oriente would bring home Logan Wyatt and put the first run up on the board. Off this hit, Oriente would extend his hitting streak to a career-best 11 games. The middle innings turned into really tight baseball, as both teams started trading runs. UVA countered with a run of their own in the top of the fifth, but Tyler Fitzgerald’s third home run of the season in the bottom of the inning would the Cards on top yet again, 2-1. Not to be outdone, a pair of RBI doubles by the Cavaliers would put Virginia up ahead in the top of the sixth, but the Cards would respond as well with a sacrifice fly from Oriente to knot things up at 3-3 after six innings. Once Virginia took a 4-3 lead in the seventh inning, starting pitcher junior Adam Wolf’s day would be done. Despite giving up 3 earned runs on 7 hits in his 6.1 innings of work, he was able to strike out 7 batters and only allow 1 walk. Junior reliever Bryan Hoeing would give Wolf some proper relief, as he would pitch 1.2 scoreless innings and strike out a pair of batters. 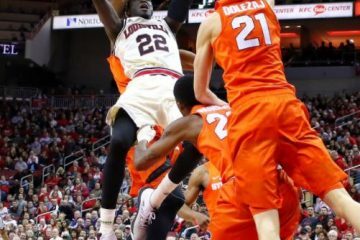 Like so many times this season Louisville found themselves having to mount a rally, this time late in the game instead of in the early frames. A pair of singles in the bottom of the eighth from Logan Wyatt and junior outfielder Josh Stowers followed by a wild pitch would get both runners into scoring position with only 1 out. Facing a late inning pressure situation, Danny Oriente came through in the clutch and sent them both home with a double down the left field line to take a 5-3 advantage. Giving normal closer Sam Bordner the night off, sophomore right hander Shay Smiddy came into the game in the top of the ninth and closed the door on the Cavs to register his first career save. 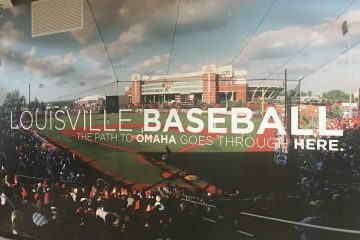 Thanks in part to an all around defensive collapse in the sixth inning, the Virginia Cavaliers took down the Cards 5-4, snapping Louisville’s six game winning streak and evening up the weekend series at a game a piece. Louisville swung hot bats to start the game, driving in 4 base hits in the first inning including a pair of RBI singles from sophomore first baseman Logan Wyatt and junior outfielder Josh Stowers. UVA countered with a run in the second inning, but Louisville answered right back with a bases loaded 2 RBI single in the third inning off the bat of sophomore outfielder Ethan Stringer to make it 4-2 after the early frames. Virginia put yet another run on the board in the fourth, but it wasn’t until the sixth inning that the wheels completely fell off for Louisville. Sophomore left-hander Nick Bennett made yet another Saturday start, and while he got no favors from the home plate umpire, he unfortunately didn’t quite look as sharp as he normally does. With two runners in scoring position and two outs, a base hit compounded by an egregious error in the outfield would bring home two runs, and another base hit after that would bring home that runner as well. Junior right-hander Riley Thompson would come relieve Bennett to record the final out of the inning, but the damage had been done and UVA held a 5-4 lead through the middle innings. 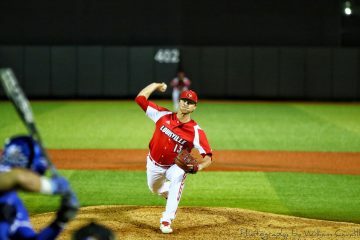 Scoreless frames from Thompson, freshman left-hander Gavin Sullivan and graduate transfer right-hander Austin Conway gave Louisville a chance in the final three innings, but the Cardinal Nine could not capitalize. 7 of Louisville’s final 10 batters of the game were sat down on strikes, including all 3 in the ninth inning. The anemic offense to end the game secured the victory for the Cavs, and set up a game 3 rubber match. An absolutely masterful pitching performance from freshman right-hander Bobby Miller was not enough, as a blown save opportunity from the bullpen not only cost Louisville the game, but the series as well. After Miller was on the cusp of a complete game shutout, the Cards’ bullpen was just one strike away from clinching back-to-back series victories, but were unable to finish the job. Both teams had early opportunities to crack the scoreboard in the second inning, but couldn’t capitalize. UVA got a runner all the way to third but was stranded on a line out, and junior outfielder Josh Stowers would advance all the way to third for first, but would be called out at home after attempting to stretch the play for the first run of the game. However Louisville would not miss on a opportunity in the next inning, as a single by junior second baseman Devin Mann with Tyler Fitzgerald on second base would plate the game’s first run. While the Cardinal Nine could only plate 1 run through the first eight innings of the game, that was enough for Bobby Miller in his third start of the season. He might not have stuffed his stat line, striking out only 5 batters in the start, but he threw enough quality strikes to keep the Cavaliers hitters guessing as they only mustered 3 hits off him. He also kept UVA off the scoreboard over the entirety of his 8.1 innings pitched, his longest career outing. After logging 109 total pitches and allowing a hit with 2 outs left in the ninth inning, Coach Mac finally had to make the call to the bullpen and removed Miller from the contest. Freshman southpaw Reid Detmers took the mound as Miller walked back to the dugout to a standing ovation from his teammates and the crowd. The jubilation quickly faded away, as UVA generated back-to-back RBI base hits to take a 2-1 lead. Louisville was unable to respond in the bottom of the ninth, and the rubber match went to the Cavaliers.